Life is just like relay game. You will have to pass the baton after your run, and the cycle repeats. i3 - A Platform where hundreads of lifes have converted / transformed to what they wanted to be in life. One of the elite platform for youths who wants to be a self change maker and also a global changemaker. I was privileged to be a part of this wonderful journey with i3 which transformed me completely from where I was to where I am now. I used to ask my mentor to pinch my hands to prove that this is REALITY. One day I got a call from Kunal sir - One of the MOST favourite mentors for all the i3 Delegates saying I have been invited to the Alumni meet. 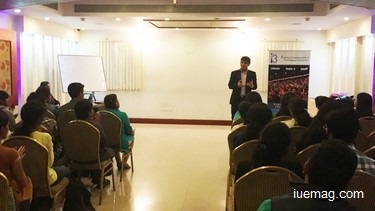 where delegates of Season 1, 2 & 3 of i3 Bangalore meet under a single roof and share about our experience and the life after i3. I was overjoved and am sure this was the same state of joy for all the i3 delegates. I used to miss those inspiring conferences that used to happen every sunday. It was like 'law of attraction' worked for me. The Alumni meet was on 23rd August 2015. Most of them made it for the reunion and I was only glad that many have changed the way they used to be before i3. I felt "What a Change Man!" Then everyone introduced themselves with the delegates of other seasons. It was more like a family reunion. Of course, Kunal sir was the Host for the day. And everyone got a chance to share about their experience after i3. I shared about my exuberent journey with World Merit and about my USA Trip representing my country. Sunil sir (True IUITE of Season 1) shared about his experience in Nepal. He says "I was in a bus, suddenly there was an earth quake and a big rock fell in front of the bus. Everyone was shouting. But, I was the only person who felt WOW". His journey was filled with more of adventure in Nepal and solving the problems that they are facing after so many Earthquakes that have happened few months ago. Amit of Season 1 shared about how he was treated before and how things have changed now. After all, the Mastermind behind this wonderful platform - Sujit Lalwani Sir enters the hall and sets up the fire. Everyone was eagerly waiting for this moment and it happened Just in Time. Sir shared about how important it is to be at the alumni meets. Lots of opportunities were revealed, lots of lessons were shared during the alumni meet. It was officially declared that i3 Alumi meet will happen every last saturday of the month and lot more opportunities and news will be shared mutually. Isn't this a wonderful idea? I mean, even schools and colleges don't provide an opportunity for their alumni. And i3 does it! The major lesson I took from the entire meet was, "Life is just like relay game. You will have to pass the baton after your run, and the cycle repeats". Any facts, figures or references stated here are made by the author & don't reflect the endorsement of iU at all times unless otherwise drafted by official staff at iU. This article was first published here on 28th August 2015.